We have published several articles about the wildly popular, cross-platform and cloud-based service application, Evernote — most recently Aaron Couch’s introduction to why Evernote should be used as a go-to place for remembering everything Why You Should Be Using Evernote As Your Go-To Place For Remembering Everything Why You Should Be Using Evernote As Your Go-To Place For Remembering Everything Remember Everything. That’s the Evernote motto and that’s what it allows you to do best. If you aren't familiar yet with Evernote, you’re in for a real treat! If you have heard of it, but... Read More , and my overview of how Evernote works between Mac and Apple’s iOS devices Introducing the Newly Designed Evernote Notes & File Storage System [OS X & iOS] Introducing the Newly Designed Evernote Notes & File Storage System [OS X & iOS] When the Internet becomes part of your day-to-day workflow, resources for storing and managing mountains of data become absolutely necessary. And that's been the goal and purpose of the free and popular cross-platform notebook service,... Read More . In the last several months, the iOS versions of Evernote have undergone a significant overhaul of their user interfaces, closely mirroring the design and features of the counterpart web and Mac applications. We have added the iOS versions of Evernote to our Best of iPad Apps, and Best of iPhone Apps pages where they sit alongside our other picks for the platform. 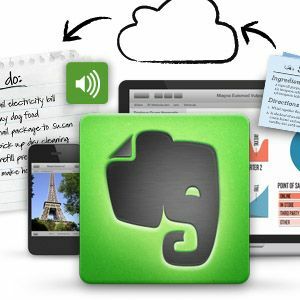 Evernote is a free universal app that works on the iPhone and iPad. The Homepage for both versions of the iOS Evernote apps includes section tabs for viewing Notebooks, Notes, Tags, and Places (a view of your notes by the location they were created.) 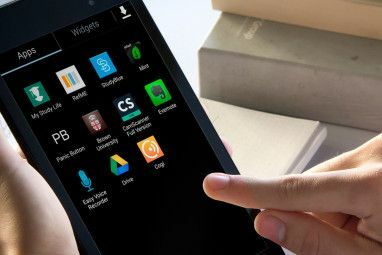 There are also three Quick Notes buttons for creating text notes, shooting and adding photos directly into a note, and another camera features for scanning documents. Tapping the Notes tab presents all your notes, sorted either by most recently updated, date created, or alphabetically by title. The iPad version of Evernote also includes a row at the top of the home page of your most recent notes that you can tap and access quickly. Previews of notes can be browsed in the List or Card view. Because of the new card view, I typically try to add an image or graphic to my individually typed notes, which makes them more visual and easier to browse. In the browsing view of the Notes section, you can search notes, or tap the plus “+” button in the top-right to add a new note. The Notebooks tab on the Homepage presents all your personal notebooks, notebook stacks (a collection of two more notebooks) and shared notebooks. In this browser view, you can also create new notebooks. The Edit button at the top-right of this notebook section enables you to edit existing titles of notebooks, as well as share a public link to a selected notebook, or share the notebook with specific people. Sharing notebooks with specific individuals, however, requires a premium Evernote account. A URL link to a notebook means that the content of your shared notebook can be viewed in a web browser by anyone with the link. See my article for more details about sharing notebooks in Evernote and Springpad How To Share Notebooks In Evernote & Springpad How To Share Notebooks In Evernote & Springpad Springpad and Evernote are awesome file cabinets for storing and managing articles, recipes, products, and text clippings we want to save for later review. But an additional way to maximize these powerful notebooks is to... Read More . Unfortunately, the Notebooks browser is a little bland, lacking the visual context found in the Notes section. 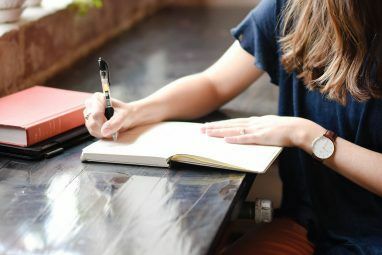 I tend to use Evernote mainly for current projects I’m working on, but if you find yourself frequently searching notes for current and past notes and other content, tagging notes might be of help to you. Also, if you frequently create notes in various locations you travel, the Places feature may also be useful for quickly finding notes. It goes without saying that notes can be created and edited in the iOS version of Evernote. The software keyboard of the iOS apps includes a collection of formatting tools (including bold, italics, check boxes and bulleted lists) as well as handy undo and redo buttons. You can also add images to notes from your device’s photo library, or shoot photos using the app’s built-in camera. Individual notes can be shared to the usual places— Twitter, Message, Mail, or Print. You can click on the little “i” icon at the top-right of a note to assign tags to a note, move it to another notebook, and view information about the date it was created and updated, as well as the geographic location of where it was added. 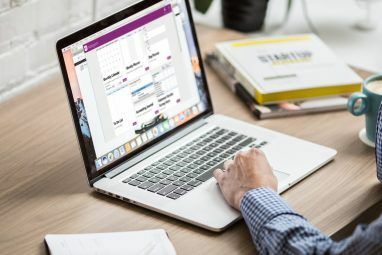 Using Evernote with a free account allows you to sync all of your notes between your computer and mobile devices, using the Evernote cloud service. Note that notes are not downloaded and installed on your iOS devices. You must have a Wi-Fi or cellular connection to the Internet to view them on those devices. Premium account users do get the option to download all of their Evernote content to their iOS devices for offline viewing. Unfortunately, you can’t selectively target individual notes for offline viewing, as you can with files in the mobile version of Dropbox. The benefits of using Evernote and its cloud service is that your notes get synced between your Mac, PC, and iOS devices. The service and apps are also supported by a growing collection of third-party applications 5 Simple Apps That Let You Do More With Evernote 5 Simple Apps That Let You Do More With Evernote Did you ever notice how the most popular apps & platforms have lots of additional add-ons and extensions that were created for them? Evernote is no different - check out the Evernote Trunk and you'll... Read More and web browser plug-ins that enable you to more conveniently add notes and other content to your Evernote account. If you’re looking for a way to store lots of stuff on your iOS devices, Evernote is a good option among the many iOS notebooks apps Open, Write, And Send: 5 Alternative Note Apps For iOS Devices Open, Write, And Send: 5 Alternative Note Apps For iOS Devices I like clean, un-cluttered note apps that I don't have to manage with folders, and that can also be used with other applications. Well, at least five note apps (Captio, Squarespace Note, Drafts, Pastebot, and... Read More . For a full overview of Evernote, download Mark’s Missing Manual for How to Use Evernote and do more with the service. Let us know what you like about the iOS versions of Evernote. What features would you like to see added or removed? On Android (Samsung running Gingerbread) and Evernote 5.0.4 - using the free, not premium storage - all notes are local to my phone once I've sync'd. "Note that notes are not downloaded and installed on your iOS devices. You must have a Wi-Fi or cellular connection to the Internet to view them on those devices. " I can go into "airplane mode" with WiFi and cellular off and still access my notes. Is that really different under IOS ? IOS users can also download notes for offline usage. Notes are auto synced to your device so you can read them when you dont have access to internet. Oh, okay, I understand now. Yeah, I think that's not the same for iOS. I got a premium Evernote account (through one of those bundle deals), and I think that's the only way you can download to your iOS device. Thanks for letting us know how it works on Android. Yes, I've read much about Evernote and even tried it. Very impressive, feature wise. BUT I will not spend the time and effort designing and building my 'personal info vault' using a proprietary app. What if, after building an extensive database, the company goes belly up? Or make changes / charges that I dislike? Sure, one can export one's files -- but in 'flat files' without all the organization, correct? While exploring / waiting for an open source equivalent, I currently use Excel as my info repository. It ain't Evernote, but it works well enough for my purposes. And there are near countless apps that can open / edit .xls or .xlsx files. ReadandShare, you make some good points. I think the company were to ever fold it would users time download or more their files elsewhere. Edit: ReadandShare, you make some good points. I think if the company were to ever fold, it would give users time to download or move their files elsewhere. My concern is not about the download. I know we can export / download our own files from Evernote. But imagine: after years of adding / organizing / linking / treeing --- you decide to leave (or are forced to) -- and you end up with a myriad of flat files in all different formats (text, avi, jpg, etc.) -- with no organization or connection to each other any longer?? Years of work undone? What I am waiting for is some kind f organizational standard that is open source and can be used by any number of organizational apps. A very rough comparison might be "bookmarks". When we wish to migrate from Firefox to Chrome (as an example) -- our bookmarks can be easily moved -- both the info itself AND the relationship / structure. Hope this makes sense. But one simply can't do that, say, between Evernote and any other organizational apps, correct? Could you tell us how you use Excel to hold and manage notes and clippings? I don't get it. All I do is build a master "table of contents" in an Excel spreadsheet -- in a combination subject category / title / alpha order. Each line item (title) consists of an HTML link to where the information is. This can be (1) tabs within that Excel file, (2) other Excel files, or (3) any other files (audio, video, PDF, etc.). Elegant and fully flexible? No. But the Excel provides an organization ("knowledge tree") that I never have to worry about recreating -- since there are countless apps that can work with .xls and .xlsx files. Evernote is easier and much more elegant. But after a while, you really become tied to it -- or else you'll have to download all your files -- and re-organize the logic and relationship all over again! This is what I truly want to avoid. Okay, I understand. Good point. It's like there needs to be a way to convert content going into Evernote so that can be easily opened in the other platforms or applications. Yes, easily opened -- and with structure / relationships intact. Lol, true, Craig, but I'm not one of them. My handwriting is not very attractive, and I now try to use voice dictation to write notes and sometimes articles. The Android version certainly allows local download with the free version. Is it really different on IOS? Al, not sure what you asking. He is saying that on the Android version you can locally download the notes for offline viewing, and asking if (really) on iOS you can't really download them.